The car rental industry has changed significantly over the last couple of decades, largely driven by the internet and general technological advances. This has allowed car rental operators to offer new and innovative solutions, providing a more attractive and customer friendly experience. Whereas this has been beneficial for the traditional operators, think Hertz, Avis and Europcar, who have introduced a number of innovative solutions, it has also opened up the playing field to new entrants as well as increased visibility for existing but smaller operators, think independents. One of the main impacts has been on the distribution side, where intermediaries such as online aggregators, brokers and travel agents play an increasingly important role. The latter have increased the competitive nature of the car rental market, e.g. through creating increased price transparency in the market while also offering better distribution possibilities for smaller operators. The e-commerce revolution has significantly changed the way car rental operators deal with distribution. 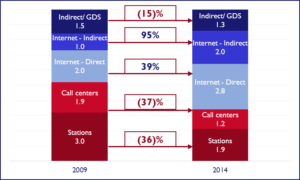 The following chart shows the breakdown of Europcar’s distribution channels for the period 2003 – 2014, and the change is significant. Looking at the actual number of transactions by channel for the years 2009 and 2014, the underlying trend is pretty clear. From 2009 to 2014 Europcar saw a decline in the number of transactions of approximately 2% from 9.5 million to 9.3 million. 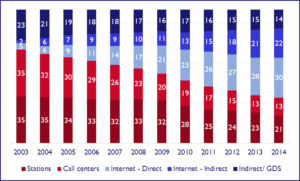 If one broadly compares channels as « Internet » (direct and indirect) and « Other », the former represented 33% in 2009 and 52% in 2015, i.e. a 19 point move, and the majority of Europcar’s transactions are now sourced through internet based distribution channels, either direct through their web site or through intermediaries. The same data points are not available for other operators, but there is no reason to believe that the same shift has not taken place at Avis Budget, Hertz and Sixt etc. Who are the intermediaries and how do they size up? The two major online travel agents are Priceline and Expedia, who both have a portfolio of brands covering different segments of the travel market. Considering the car rental market specifically, Priceline owns rentalcars.com and Expedia owns carrentals.com. In addition there are numerous other car rental brokers, such as autoeurope.com, sunnycars.com, easycar.com to mention but a few. The actual size of each is hard to discern as there is limited publicly available information on the operating metrics, the exception being Priceline, which discloses the number of rental days going through its system. The growth in itself is impressive, but it becomes even more so if one compares to the major car rental companies. On a year by year basis the below chart shows the very rapid catch-up by Priceline, who in 2015 become larger than Avis Budget International, Europcar and Hertz International measured by transaction days. This is obviously not a like-for-like comparison in that the geographic footprints are different, but it does put the size and importance of Priceline as a car rental distributor in perspective. As Priceline serves as a distributor for the aforementioned operators, there is obviously double counting in that a rental sourced through Priceline will be counted by both Priceline and the operator. However, it does clearly show the importance that the online intermediaries have gained over the last few years, particularly taking into account that Priceline only represents one intermediary and there several others in the market more or less significant in size. Going forward, there is little to suggest that the tide will change. 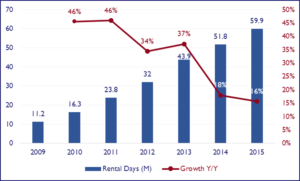 As seen above, the growth in rental days at Priceline has been +/- 8 million days p.a. in the last couple of years, but growth is slowing in percentage terms, which is simply a base effect. Eventually one can expect a steady state to be achieved where Priceline grows in line with the market (the European car rental market is forecasted to grow by low to mid single digits near to mid-term), but this is probably still a few years out. In the meantime, Priceline and other intermediaries will most likely continue to grow in importance as a distribution channel in the car rental market, at the expense of operators’ direct and other/ offline indirect distribution channels. 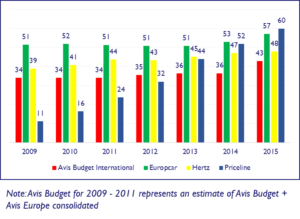 Pressure on pricing is one of the main challenges facing the car rental industry currently, as highlighted by Avis Budget in their recent earnings announcement. Assuming that intermediaries will continue to grow their share of the distribution channels, thereby commoditizing the business further, and price being a key selection criteria, particularly in the leisure segment, this is unlikely to change. Accordingly, how to deal with the intermediaries is a key strategic question for car rental operators, both present and future.